I wrote about a free website monitoring service called Montastic last January and thanks to them I figured out how really sucky my webhost is. Not all my sites are what you would call extremely successful, but I’m proud to say that they bog down their respective servers from time to time. Anyway, for quite a while I was thinking how cool it would be if Montastic would send me an SMS everytime they find my sites to be down. Easy. On the righthand menu of your web panel, click on change or add emails. Click Save to add the email address to your profile. Montastic claims to check your site every 10 minutes “at the minimum”, which is better than other free services I have checked out. So far, they have been doing their jobs properly. By adding this SMS feature, you can immediately act on a problem when it arises, whether you are at your computer or not. Thanks to Republic of Geektronica for the list of carriers. Thanks for the link. I use a monitoring service called WebSitePulse, which is far from free but has a truly remarkable number of features. I’m pretty amazed that Montastic is free – WSP is about $10/month per site for that frequency (the cost is based on the frequency of the checks). They also do MD5 hashes to see if pages have changed, submit forms, or do whatever else you tell them. Just knowing the uptime of your host is hugely valuable, though, because most people aren’t on their own websites most of the time, so they don’t know about outages. We offer a free website monitoring service called Site24x7. It lets you monitor site availability, uptime, and performance. From what we have seen the email2sms functions that carriers provide can not always be trusted. And for this kind of service it’s critical to know that you get a SMS if there is trouble. I use Host Tracker and they’ve been pretty cool. I have a detailed log of all the outages for my site showing how many minutes per day there was an outage. I did try montastic but I wasn’t really feeling it. 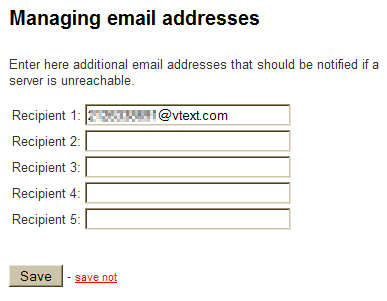 One problem with this solution is that it’s only of use with carriers that offer the email-to-sms interface. At the moment, this is a very few networks throughout the world who provided them for the use of their customers and not automated processes. Nevertheless, if your carrier provides it, then great! Well, basicstate.com is younger than it’s two competitors mentioned here, but it might be worth your time to check out. The testing interval is decent for a free service, and it supports email to sms. Feel free to drop by and take it for a spin. If you just like reading, the journal is not obviously linked, but you can find it at the uptime journal. It provides website monitoring, web server monitoring & server monitoring from worldwide locations. The customer will receive downtime alerts via SMS & Email. “Worldwide” is the key. In US, there are some sites that offers SMS message only inside US. The other key is that the pricing is NOT a monthly fee. It is priced for fee per message. So if your site is robust, it won’t cost you much. This is almost an essential for startup where money is tight. Another website monitoring service is http://www.ipcheckpoint.com. Has lots of features, but still very cheap. I have also used host tracker and it is also good. I have a detailed log of all the outages for my site showing how many minutes per day there was an outage. Still i’ve not use Montastic.